There are 2 WiFi printers, 1 Win7 PC, 4 laptops, 2 on Windows, 2 on Linux. I need to log into the Win7 PC server to access a Shared Folder that is dedicated to this laptop to use, as a host for files. This laptop is dual boot with Win10. Secure Boot is turned off. This laptop is used for a home based business for my daughter, it is critical that I make it easy for her to learn Linux, Peppermint's ICE is what drew me to this OS for her, as she must have access to MS Office natively, not thru a crutch.... she knows nothing of Linux, so I have to make the path easy for her. I need to put a Network icon on the Desktop linked to her Shared Folder on my Win7 Desktop. I use Linux Mint 18.3 Cinnamon for my daily driver laptop... and when I saw Peppermint, I knew it was the way to go for my daughter. She is very much upset with Microsoft's constant intrusion on her life, and constant updates that take her PC away from here when she needs it the most. Just back to the forum, been a long night, dental surgery aftermath keeping me awake. I will be following up those tutorials after this post. I now have my daughter's laptop showing some network items, it is logged into the WiFi and can browse the internet, that is not an issue. here is what her Acer sees when I click on Network from NEMO. 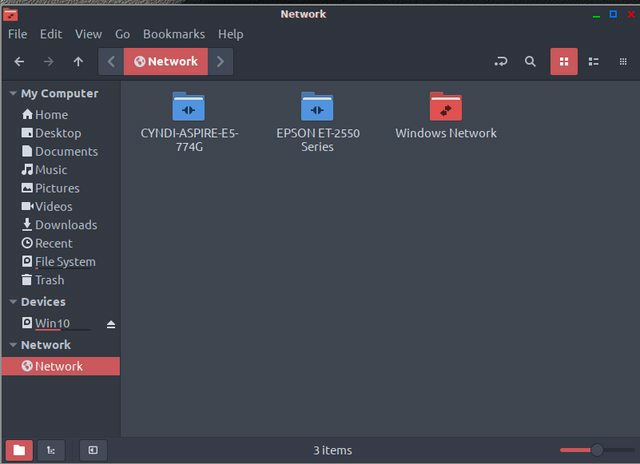 When I click on "Windows Network", it does not show anything there at all. Might be related to Permissions? I am brand new to Peppermint, but been using LM18.3 for a couple years, so know my way around. From my own Linux Mint laptop, this is what I see when click on Network. and that is exactly what I should be seeing from Peppermint, and I don't know why it is not seeing that list of devices.... the TP500L is my ASUS Linux Mint laptop that I am typing on right now. JOHN-PC is my Win7 Desktop in the office, we should be able to click on that and drill down into the sub-folders and finally reach a dedicated folder there that I named CYNDI. I just don't understand, why it is not showing the Win7 PC in my office? if I could access that, and then place the sub=folder on her desktop, I would be finished with her setup. Let us know if the first tutorial makes any difference. I am having the exact same problem as AZgl1500. When I double-click on the Windows Network icon it opens up and says 0 items. I modified the smb.conf file per the instructions in your tutorial, saved it and rebooted my PC. But it made no difference. It is still showing none of the shared folders on my Windows PCs. Any suggestions as to what I should do next to resolve the issue? Thanks for any and all help you can give. Am new to Peppermint and other than this, am really liking the OS so far. Which version(s) of Windows ? And which workgroup do they belong to ? Windows 10 and the workgroup is WORKGROUP. Also check that you are allowing access through any fire walls on the computers and router. Thanks for the replies. Appreciate your help and suggestions. I double-checked my firewall and network discovery settings in Windows 10. Network discovery is turned on and the firewall is set to allow incoming connections on the same network. So, I'm not sure why I can't see my Windows shares on Peppermint. I can see them from other Windows PCs. So will keep looking online for any solutions I can find. If you have any other ideas, please do share them. Thanks again.